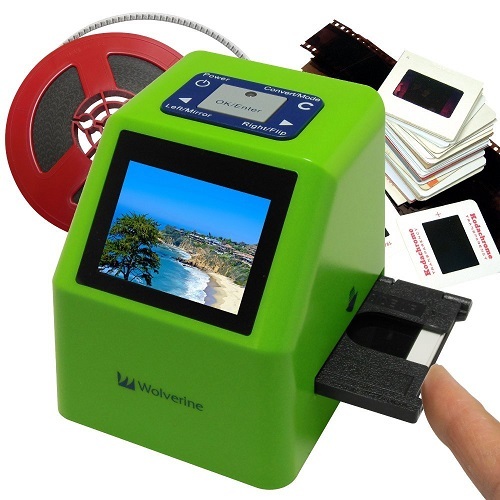 The Wolverine F2D Super makes preserving your memories convenient, easy, and fast. Convert all of your 35mm, 110, 126KPK negatives, slides and Super 8 films into 20 megapixel digital JPEG files. Fast loading adaptors make scanning slides, negatives, and film quick and effortless with only a press of a button saving you time and money. Just plug the scanner into any AC outlet or USB port and start scanning your memories right out of the box. There’s no need to use a computer or software. Choose one of the preset options to make automatic corrections, or manually adjust the brightness and color using only the scanner. Eliminate the need for expensive and complicated editing software. Your scanned pictures and slides can be saved directly to the scanner’s internal memory (up to 40 images). Use the optional SD/SDHC memory card reader to store even more photos on the scanner. Connect to any Windows or MAC computer for unlimited digital storage.